A few weeks ago, while hiking somewhere in Europe, I had a realization: It was time to consolidate our offerings and lower the total price. Today we have finished the work to make that easy for you to do just that. You can simply click the Upgrade or Pricing links from the bottom of any page, when you are logged into JibberJobber, and you’ll be on your way to having a year of all the JibberJobber features and the entire video library (which will grow over the next year+). I want to write paragraphs and paragraphs of why this is great for you, and why we came to this decision, and the history of our pricing changes, but really, all you need to know is that you are getting JibberJobber + the Video Library for a killer deal… about 75% off of the list price (which was $9.95/month for each of those)… now it’s only $60 for everything for a year. 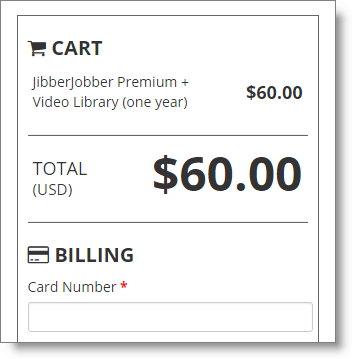 One $60 upgrade gets you JibberJobber premium for a year and access to the entire video library (including LinkedIn for Job Seekers) for a year! Please share this with your job search friends. This price will make it a lot easier for many more people to get in control of their careers and get closer to their dream job. More importantly, they’ll be prepared for the changes they’ll experience during the duration of their careers. We’re here to empower YOU. Take advantage of this new pricing and get everything we have to offer!